In this three-lesson online live webinar course l provide you valuable, research-based tools, time-tested tips and hard-learned techniques that will show you how to ditch your pitch and speak from your heart whether your audience is 1 or 100s, for 1 minute, 10 minutes or an hour or more, plus Q&A time and action sheets. Contact Sharon for her upcoming small group coaching live webinar series. Speak From Your Heart And Your Head with a simple, highly effective, non-salesy way that will turn “prospects” into paying clients that I like to call a one-sentence story. If you can retell something that has happened to you in the past, even if it’s a story about walking your dog, you can master the one-sentence story. Specific goal: Getting comfortable talking about what you do and nurturing multiple perfect descriptions about you and what makes your work special so you are prepared for any audience and opportunity. Connect Your Body, Mouth, and Heart so they flow as one using verbal and body language cues of confidence that work in any situation. Get over your fears! If you’re feeling desperate for clients or doubting yourself, those fears will come across more than you may realize. So let’s get those butterflies flying in formation. Specific goal: How to magically draw you closer to others using your voice and body language to support your message. Be you on purpose! Ditch Your Pitch isn’t just for work! You discover easy ways to build rapport in any situation, how to talk to others with ease and grace and how to foster quality relationships effortlessly in every part of your daily life too. 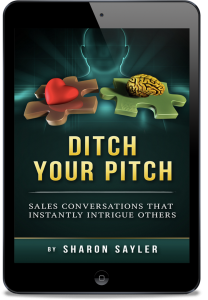 Ditch Your Pitch is a three-part live via webinar course with Sharon Sayler on each call and includes Q&As and easy to use worksheets. All three lessons will be recorded to listen and learn at your own pace if you can’t attend ‘live’ and Ditch Your Pitch includes simple to follow action sheets and the transcripts of the lessons will be in PDF format. Get the Ditch Your Pitch course for just $147! p.s. Now, if now is not the time, I also want to thank you for being here and considering the opportunity to work with me directly. I know how valuable your time is. And if now is not the time, I certainly understand. But I also know that there is never a perfect time and remember with just the one payment of $147 you’ll take leaps forward in how you talk about yourself and what you do. There is no experience needed. All levels are welcome in this community and course. This is a perfect way to develop how you talk about what you do, your business and craft a connection from your heart with your audience.